We're proud to provide SEO services. In preparation for an upgrade from Drupal 6 to Drupal 7, USM was faced with the need to migrate four Drupal sites based on five codebases from an onsite installation to a hosted environment with Acquia. USM was seeking an experienced group of Drupal architects to work hand-in-hand with their iTech team to determine the necessary functional and configuration changes needed to accomplish the migration. USM had a particular interest in leveraging Acquia’s search capabilities. The University reached out to Last Call Media to drive the high-level technical planning and heavy lifting of a migration to the Acquia Cloud. 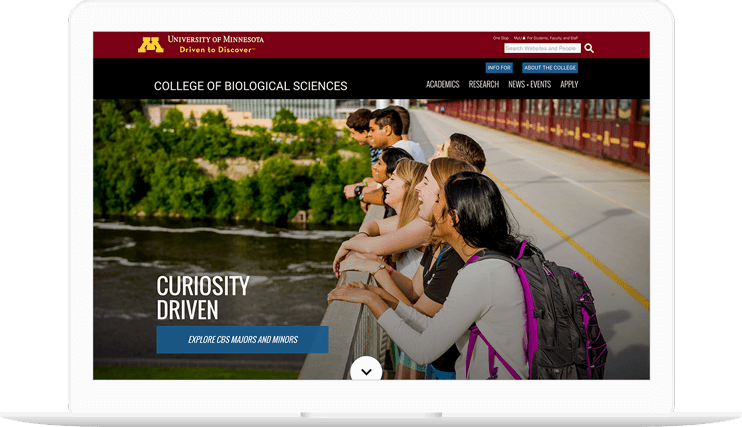 The University needed a team with platform migration experience to come in and bridge the gap between Acquia and the University’s internal iTech team to ensure that the launch went smoothly. Aside from our experience and planning skills, there were several mission critical pieces of the overall infrastructure that needed to be changed to fit within Acquia’s ecosystem. One of these was the site search. USM had previously used a combination of several open source tools to feed data from several different sources into the site’s search engine. While this solution worked well, it was being cut in favor of Acquia Search, powered by Apache Solr. The University brought us in to build a search platform that would be capable of indexing the content of all of the Drupal sites, and searching either independently (within each site’s own content silo), or across the board. Working closely with the iTech team, we planned and executed the search feature within the new infrastructure, including the configuration of environment specific search, so the University team could iterate and test the site search in the development and staging environments before rolling new features to production. The final piece of the puzzle was to bring the site’s performance and security up to Acquia’s standards. We worked hard to make the vast majority of the content cacheable by Acquia’s edge layer, and brought iTech and Acquia representatives together to find resolutions for all of the issues surfaced by Acquia’s Insight reporting. At the end of this process, we performed a successful load test across all 4 sites, effectively proving the sites were ready for launch. As launch day grew closer, we began to focus on the final details. With iTech’s help, we formulated a simple and clear launch checklist that would keep everyone on the same page when it mattered the most. When the final cutover was finished, we had almost no post-launch issues to address. The work was completed on a timeline that allowed USM to minimize risk by switching to the new site while the University was on break. USM achieved their goal of a smooth migration to Drupal 7 on the Acquia hosting platform with no down time. The Rainforest Alliance's everything, on demand. Last Call is a delight to work with – not only are they top-notch developers, they are great communicators, even with the least tech-savvy amongst us. My favorite part about working with them is their unfailing can-do attitudes and ability to follow through on even the tightest deadlines. We’ve thrown all sorts of crazy complicated requests at them and they surpass our expectations every time. Last Call makes us look like web rock stars… they are so good I almost don’t want to let the word out! When we met, Rainforest Alliance needed to upgrade their existing Drupal 6 website to the latest major version, Drupal 7. We developed and implemented an upgrade and migration path for the site with 85 modules, including 35 custom modules, to bring the site to a fully functioning Drupal 7 build. The upgrade was fully developed and its deployment was seamless. The Rainforest Alliance site went from Drupal 6 to 7 with zero downtime. We enjoy a strong relationship with the Rainforest Alliance team, working together to continuously deliver strategic value in their digital properties, and were proud to be chosen for a full site redesign and upgrade. Our work continues as the Rainforest Alliance’s development team, embedded within their internal Web Service Department, scaling our resources up and down as needed.